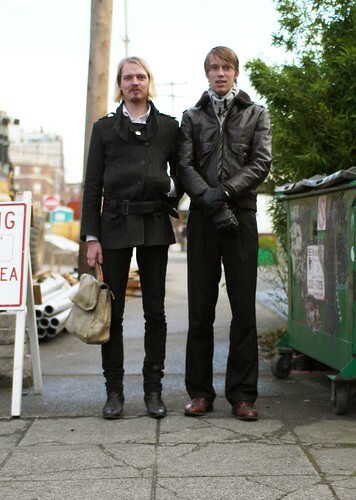 John O'Donnell and Mikko Freeman in Capitol Hill. I love the weathered leather bag on the left and the mixing of black and brown on the right. oh and I like the guy-on-the-right's pant fit. casually tailored perfectly baggy. Hi anon. - Thanks! & I agree about the fit of his pants...I love how their outfits both match & look different from each other. isn't the one on the right from the band - Holy Ghost Revival?